Tori's parents were also smokers. It is common for zoo patrons in Indonesia to throw food and cigarettes at animals, even though there are signs telling them not to. In Tori's case they will throw a cigarette in to get her to smoke, then laugh and take pictures. 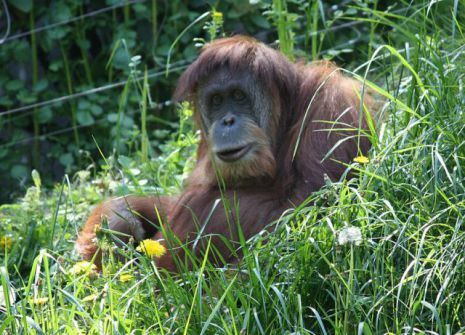 Tori's partner, Didik, is new to the zoo and has not taken up smoking. Instead, he prefers to stamp out lit cigarettes that are thrown into their cage. Zookeepers are concerned that he will eventually succumb. In Indonesia, more than 70% of men over the age of 20 are smokers and zoo officials have had trouble trying to keep visitors from smoking. Previous attempts to get Tori to stop smoking have included offerings of food and putting out the cigarettes with water. She apparently holds two fingers to her mouth when she wants a cigarette and starts to throw things if one is not quickly forthcoming. The new plan will move her and Didik to a new habitat in August, on a small island on the premises where she will be kept away from visitors' "gifts." They hope that the new home, which will include large trees, rope swings, and sweeping views of the facility, will help distract her from her addiction. Until the move can be made, additional volunteers have been put on guard duty and mesh netting will be installed to keep people from throwing their butts to Tori.